There's nothing quite like taking a morning or evening out of your daily routine for a little pamper sesh, some quiet time to just relax and rejuvenate. My 'me' time is usually a sunday morning if we're not out for a walk or exploring new places. I usually slather on some intensive hair treatment and apply a face mask, maybe paint my nails and put on some of my fave tunes. This week, I tried something different, a Herbal Facial Steam. I've been doing some research into home-made and organic beauty lately as I really want to try using less chemicals on my body and to make more conscious decisions about the brands I do use, how ethical, sustainable and environmentally friendly they are. Also, It can work out a lot cheaper to make your own beauty products, so it's a winner all round! Warm, moist heat from the a facial steam encourages pores to perspire and breathe, which, in turn, boosts circulation and injects moisture into deep skin layers. The steam helps to get rid of toxins, encouraging the appearance of less prominent black heads and clogged pores...hoorah! With the help of the steam, beneficial oils from the herbs are released into the skin and act as astringents or tonics to aid in healing. This super refreshing, pore cleansing steam has a mix of herbs that will tighten your skin, boost circulation and combat excessive oiliness. 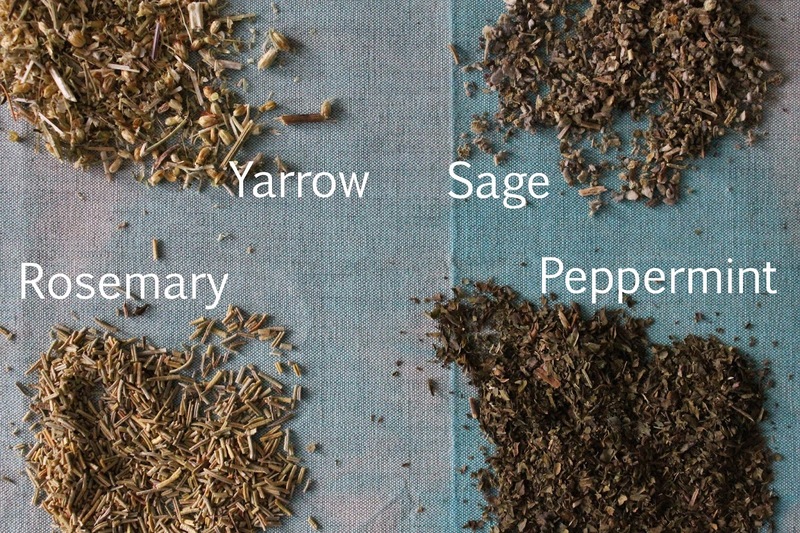 You can use this steam once or twice per week and just mix up the herbs as needed. I already had Sage and Rosemary in amongst all my other herbs and spices I use for cooking. I purchased my Peppermint and Yarrow from Ebay,it was really affordable and gave me enough to last for months. First, prep your skin by giving it a thorough cleanse. I like to use a cleanser first then give it a another cleanse with some face wash.
Add your herbs to a large bowl and place in a position where you can sit comfortably for 10-15 minutes. Pour in the boiled water and let steep for 5 minutes or so. After the herbs have been infusing for 5 minutes, place your face directly over the bowl, about 10 inches from the water so you avoid burning your skin. Cover your head and shoulders with a large towel to create a 'tent'. Now, simply close your eyes, breathe deeply and relax. Once finished, splash your face with tepid then cool water and pat dry. My skin felt so soft and nourished after this and breathing in the herbs was so refreshing and relaxing, it's a great way to unwind. I'll definitely be adding this to my weekly routine.